The 35th Infantry Regiment Association salutes our fallen brother, PFC Jerry Joseph Kolar Jr., who died in the service of his country on January 18th, 1967 in Binh Dinh Province, Vietnam. The cause of death was listed as Multi-Frag. At the time of his death Jerry was 20 years of age. He was from Chicago, Illinois. Jerry is honored on the Vietnam Veterans Memorial at Panel 14E, Line 49. The decorations earned by PFC Jerry Joseph Kolar Jr. include: the Combat Infantryman Badge, the Bronze Star, the Purple Heart, the National Defense Service Medal, the Vietnam Service Medal, the Vietnam Campaign Medal and the Vietnam Cross of Gallantry with Palm Unit Citation. A Chicago soldier who had been counting the days until he could come home again was one of two Chicago area servicemen listed by the Defense Department yesterday as having been killed-in-action in Vietnam. PFC Jerry Kolar Jr., 20, had written his last letter home December 20 saying, "It won't be long now, just four more months and Ill be home." said his mother. 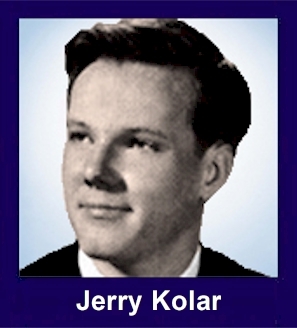 Kolar lived with his parents, Jerry Sr. and Florence Kolar, at 3021 S Millard Avenue. A 1964 graduate of Farragut High School, Kolar was Drafted December 3, 1965 and had been in Vietnam eight months. Kolar was a member of the Ralph Turdy VFW Post. He is also survived by a brother, Thomas Kolar. Services will be January 26, 2 p.m. at H Marik Sons Chapel with internment in the Bohemian National Cemetery.